Hi everyone, it's time to come back. I realized something, it is so easy to stop blogging. 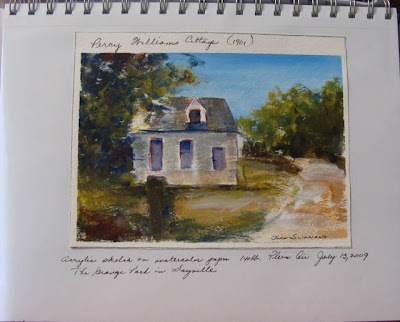 Plein air painting is still a weekly event with me. I want to start posting some of my recent work. This floral still life is a 16x20 still life on a wood panel, it's almost finished. Another revelation I had, it doesn't matter big or small, finished or unfinished as long as we keep painting. So that being said, I hope everyone is enjoying their summer. I will be visiting soon. I see some pretty awesome work popping up on my blog. Acrylic sketch on 140lb. watercolor paper, mounted on a note book. I think the time has come that I do some serious work. All of this sketching is lots of fun, but it's time to paint and not post for awhile. Happy painting everyone. Today I spent the day on the computer and making up my note - coffee table books. Thought it would be fun just to make up these books with acrylic or watercolor sketches and scribbles. 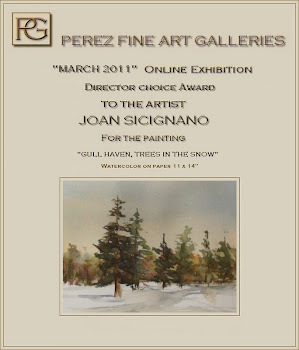 Jill Berry a very talented plein air artist has honored me with the BELLA SINCLAIR AWARD . 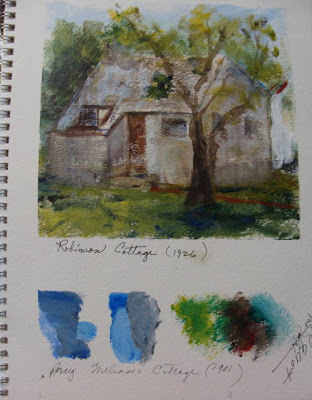 Thank you Jill, for the support and encouragement you have given me since I began plein air painting. 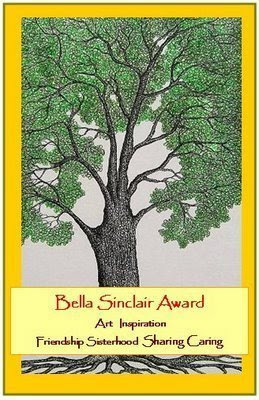 The BELLA SINCLAIR AWARD is about Art Inspiration, friendship, sharing , caring and sisterhood. I would also like to share this award with the following artist bloggers who inspire me. 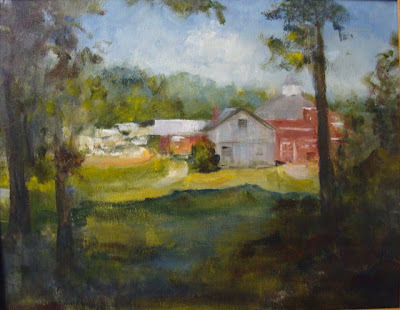 Roxanne Steed: her lovely plein air paintings are both beautiful and inspirational. 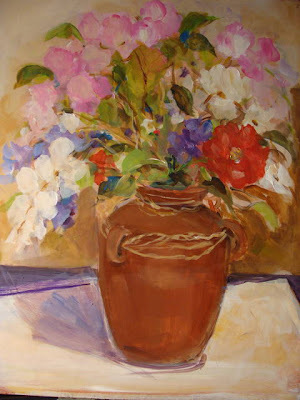 Dori Dewberry : for her variety of subjects florals, plein air or figurative. A very talented lady. Judy Mackey: Her courage in trying and succeeding different painting approaches. Resulting in beautiful paintings. 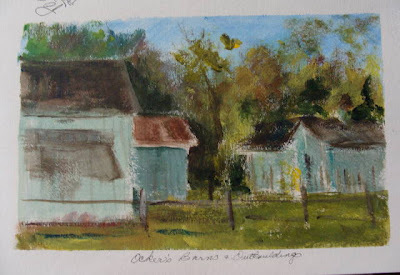 Cathyann Burgess: Great artist and teacher. Kim Vanderhoek: Her beautiful plein air and painting of birds. 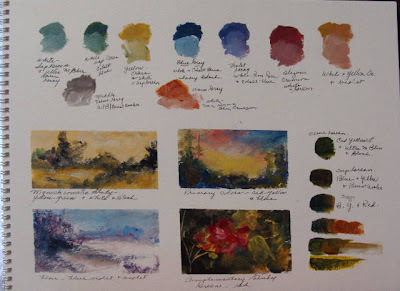 Maggie Latham: I know she is taking a vacation from blogging, but it was Maggies blog that inspired me to do tonal and color studies, which are very helpful to me. A personal thank you to all of these ladies who are dedicated to their art and in their sharing, encouragement and friendship. A group of buildings that I really liked. After doing the sketch, I walked up for the name of the buildings. 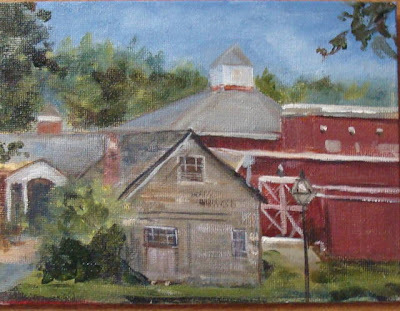 Ocker's Barns & Out Buildings. I had a good laugh and told Jeanne Rogers what we both painted. Acrylic sketch on watercolor paper. The Robinson Cottage (1926). I have enough info to proceed with a painting on canvas. And of course photo's. Painting at The Grange Park, beautiful day, and very nice people from the SBAA group. Carolyn Lewis book Mood and Atmosphere in Oils, even though I am using acrylic, it is still a great help. 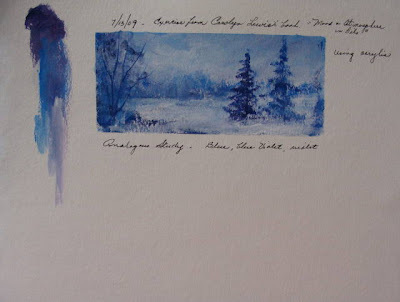 This is an exercise using blue, blue violet and violet. 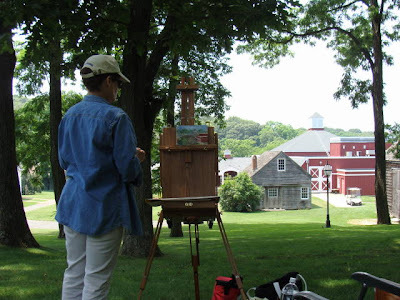 Tomorrow is another plein air painting session at The Grange in Sayville, can't wait. 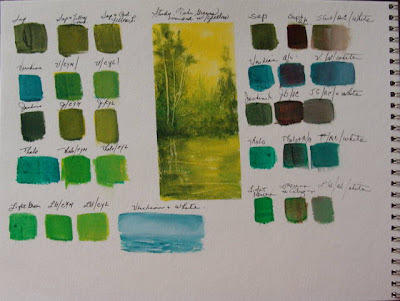 Green, sap, viridian, Jenkins, Thalo and light green. The above mixed with cad. yellow medium, and cad yellow light. Center study done with the above colors. These exercises from Carolyn Lewis's book are a great help to me. The greens on the right are all grayed down with alizarin crimson and white. I find these studies very helpful . Monday morning back to basics. From a distance, same scene. Just started this one of Stony Brook. Just need to add more tones. Trying to forget the lines at the suggestion of Karen Phipps, something I would love to do. Trying to improve my plein air from yesterday. Still needs work. I realize that I should pick easier subjects. What was I thinking. All of these hard lines and edges is definitely not what I enjoy painting. 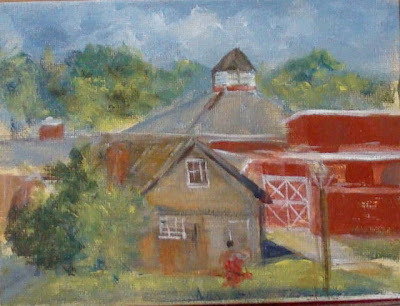 But I must say, that I will continue to paint buildings and learn from my mistakes. 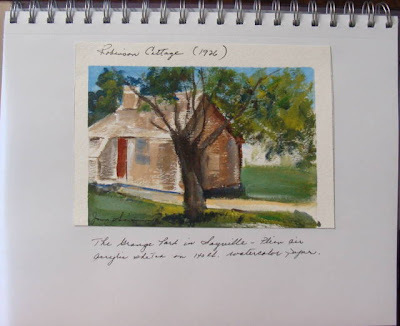 Next week its the The Grange in Sayville, looking forward to my next adventure doing plein air. Here it is warts and all. I have my work cut out for me tomorrow. What a thrill, painting plein air, with lovely ladies from the SBAA. 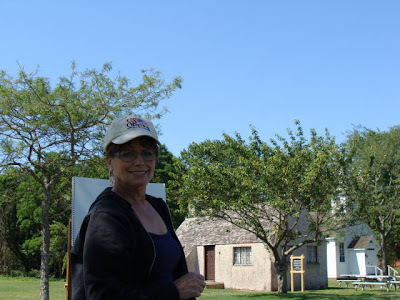 We painted at the Long Island Museum of American Art grounds in Stony Brook. It was my first time painting with other artist, first time away from my own back yard. 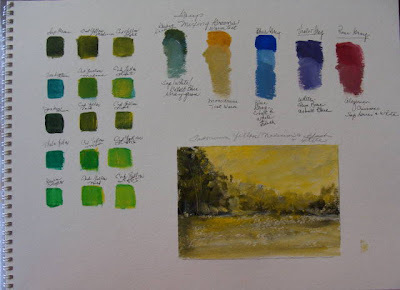 Color studies in acrylic, working from Carolyn Lewis book Mood & Atmosphere. After the holiday weekend I like to go back to basics before tackling anything to complicating. Mood & Atmosphere in Oils., but I thought I would apply the same theory to acrylic.